it makes your living and working space look more organized and tidy. With cable sleeves, no need to worry the messy tangled cables depressed you or trip your kid. and any other wires at home, office or workshop. QUALITY ASSURANCE: If you have any questions please contact us at any time, we will solve the problem in the any time, your satisfaction is our final goal. √【CLOSE METHOD】: Smooth zipper. Just gather cables together, wrap the sleeve around and zip-up. 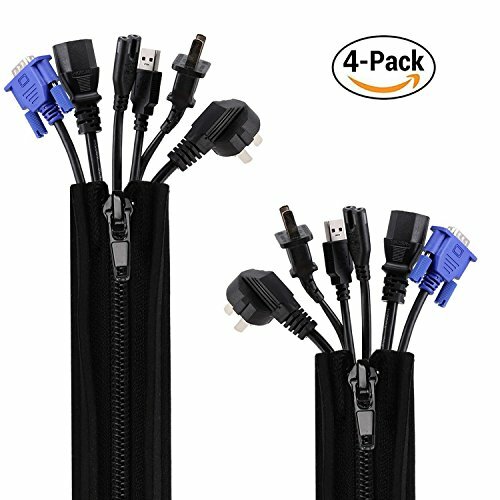 √【BEST VALUE】: 4 pieces cable management sleeves with each 19.5" long and 1.2" diameter when zip-up. Easy to cut with scissors to get holes you want., and you could manage up to 8-12 cables in one sleeve. √【DURABLE MATERIAL】: The cable sleeves made of flexible and durable neoprene material, and protects your cord from water, dust, pet chewing, aging and breaking. Create a safer living environment. √【NEAT AND TIDY】: Ideal for keeping cords organized at home, office or studio. The cable sleeve zips up your wires into a neat tube while still providing easy access when necessary.All the cables are wrapped up and hidden in one sleeve from sight, it makes your living and working space look more organized. √【100% RISK-FREE PURCHASE】: If you're not completely satisfied with your organized cables, you can benefit from Vivefox's 100% money back guarantee and get a full refund. So get the cable management sleeve and try it out risk-free! If you have any questions about this product by Vivefox, contact us by completing and submitting the form below. If you are looking for a specif part number, please include it with your message.